It’s often easy to get trapped in the past, or stuck worrying about the future. This becomes a problem when we sit down to meditate, and can cause thoughts, feelings or distractions to arise. Yet the “here and now” is always waiting for you to attend, and join in her dance. Even if you have little experience with meditation, or have given up in the past due to thoughts or distractions, there are simple ways to meditate. By focusing on something, like our breath or a mantra (a word or phrase, which when repeated functions as an object of concentration), we can trick the mind into forgetting about our thoughts and distractions. Give it a try, and if you get distracted simply return to your chosen focus. Let this quote help you remember what meditation is all about. 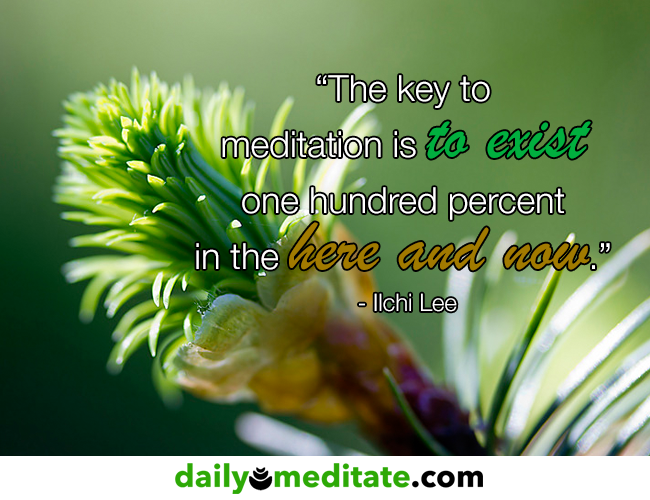 Have you managed to exist one hundred precent in the here and now? Don’t forget to leave a comment below.